Calling 2010 'Best Year' On Safety Was Mistake, Gulf Oil Rig Owner Admits : The Two-Way Transocean Ltd. owned the rig that exploded a year ago, killing 11 workers and creating a massive oil spill that took months to contain. Now, it says it was "insensitive" to say in a regulatory filing that 2010 was — statistically — its best year. 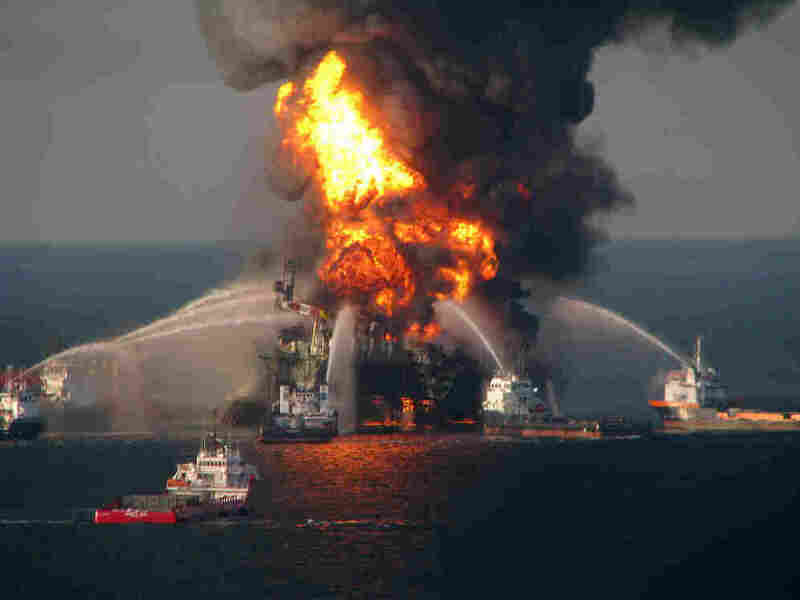 April 21, 2010: Fire boats battle the blaze on the Deepwater Horizon rig. "Notwithstanding the tragic loss of life in the Gulf of Mexico, we achieved an exemplary statistical safety record as measured by our total recordable incident rate ('TRIR') and total potential severity rate ('TPSR'). As measured by these standards, we recorded the best year in safety performance in our Company's history, which is a reflection on our commitment to achieving an incident free environment, all the time, everywhere." Now, in a statement to CNN, the company says "we acknowledge that some of the wording in our 2010 proxy statement may have been insensitive in light of the incident that claimed the lives of eleven exceptional men last year and we deeply regret any pain that it may have caused." The SEC filing also shows the pay raises going to Transocean executives, including a $200,000 salary increase for President/CEO Steven Newman.